Literature in developmental psychology suggests that mothers and fathers both play unique and important roles in their children’s development. However, research investigating the unique contributions and psychological functioning of fathers of youth with developmental disabilities, and the role that fathers play in effective intervention, remains limited. Whereas evidence suggests that parent-mediated interventions for children with autism spectrum disorder (ASD) can lead to increased engagement from parents, and reduced stress and psychopathology commonly experienced by parents of youth with ASD, these interventions often do not specifically address potential benefits of paternal involvement. 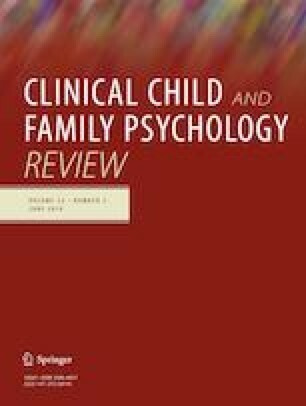 This systematic review aimed to understand how often/how commonly research on children with ASD examines the father’s role within the family, how often fathers are targeted directly during intervention efforts, and the impact of increased paternal involvement. This review suggests that fathers of children with ASD are not often included in research on children with ASD, in either their general involvement or in their inclusion in intervention. While studies generally suggest that these fathers may be less involved than mothers in childrearing practices, having both parents highly involved may improve the overall family system across many levels, and fathers may be equally as effective as mothers in implementing intervention strategies. Overall, this review suggests that while often overlooked, fathers of youth with ASD make important contributions to children with ASD and the larger family and should be included in future research on children with ASD.